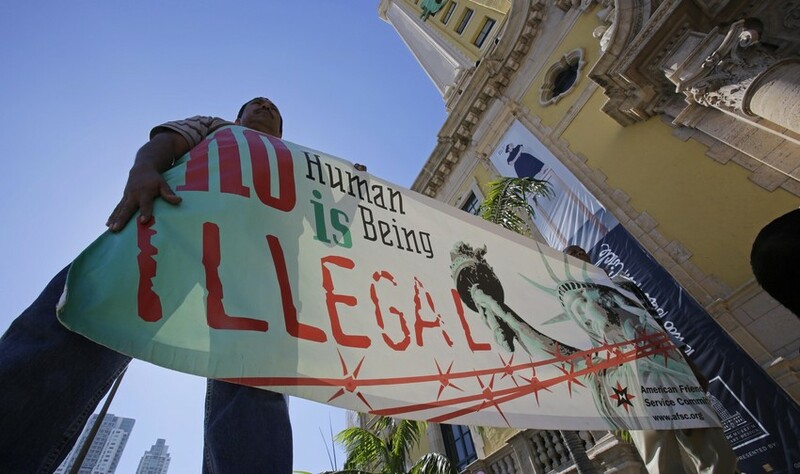 File: Immigration reform activists hold a sign in front of Freedom Tower in downtown Miami, Jan. 28, 2013. File: Immigration reform activists hold a sign in front of Freedom Tower in downtown Miami, Monday, Jan. 28, 2013.
Who would have thought that Donald Trump could be right about anything? I’m referring to Trump’s speech last March to a half-empty room at the Conservative Political Pac Conference, when he railed against immigration reform while several other GOP bigwigs struggled with trying to bring the Republicans along on the issue. But The Donald, in characteristic slash-and-burn style, railed with a warning about a path to citizenship – and not just the moral meaning of it, the way former Sen. Jim DeMint, who now heads the Heritage Foundation did, or based on national security concerns, however faux, like Arizona Gov. Jan Brewer has posited. No, Trump’s Cassandra moment was crass and political, aimed squarely at the electoral consequences of providing a path to the voting booth for 11 million mostly Latino undocumented residents. Well, according to an analysis by Politico based on data from the U.S. Census and Pew Research Center, Trump was dead-on. Those 11 million new voters – and if all goes according to plan, the path to citizenship for some will come as early as 2018, the bulk around 2026 – will lean heavily toward the Democrats. And here’s the fallout: Swing and almost-swing states like Florida, Colorado, Nevada and North Carolina will fall much more easily into the Democratic column. And the new swing states could prove to be places as currently red as Texas, Arizona and Georgia – all with estimated undocumented immigrant populations that exceed Mitt Romney’s victory vote margins. When you consider the GOP’s other population shift problems – especially the giant swerve toward urbanization, which favors Democrats (84 percent of Americans already live in cities) – there’s no question the Republicans are between a rock and a hard place. If they don’t engage with Latinos on immigration reform, their resistance will engender even greater hostility from a growing demographic – a demographic headed to majority status in an inexorable march. But if they surrender to the path of citizenship, they are also surrendering – at least in the short term, after the newly authorized residents become citizens – the possibility of continuing as a viable American party. Neither scenario is good for the GOP, which is why immigration reform will be dragged out and then dragged down by Congress: why no meaningful reform has a real chance at all this time around. There is a third way, of course, but no one – not Trump, of course, not Sen. Marco Rubio or Sen. Ted Cruz, or Rep. Paul Ryan (now palling around with immigration champ Rep. Luis Gutierrez) nor DeMint nor anyone else – is talking about it, because it would mean a wholesale rethinking of the GOP. That would be to go ahead and create a path to citizenship and use the time from now to the first blossoming of voters to engage with Latinos on issues they care about even more deeply than immigration, such as education, healthcare, and hemispheric matters. I’m no fan of the GOP, but even as I push back on their policies and proposals, I understand one solid purpose for the Grand Ol’ Party: In the absence of another viable party, they’re the only thing stopping the Democrats from turning the U.S. into a one-party country. And that’s not good for anybody.